I never grow tired of cookies and biscotti are my favorite kind. That crunchiness! Chocolate Anise Biscotti have all the qualities of a perfect cookie with a hint of anise, chocolate chips throughout and a lovely chocolate edge that makes every bite so good! Anise is also called aniseed. It is a flowering plant native to the eastern Mediterranean region and Southwest Asia with a flavor similar to star anise, fennel, and liquorice. Anise is used to flavor food and alcoholic drinks, especially around the Mediterranean. The whole anise seed is harvested from the fruit of an annual herb of the parsley family. The seed is small and curved, about 0.5 cm long and grayish brown. Anise is sweet and very aromatic, distinguished by its characteristic flavor. The seeds, whole or ground, are used for preparation of teas and tisanes as well as in a wide variety of confectioneries. Black jelly beans, Italian pizzelle, German Pfeffernüsse and Springerle are just a few regional treats that include anise. 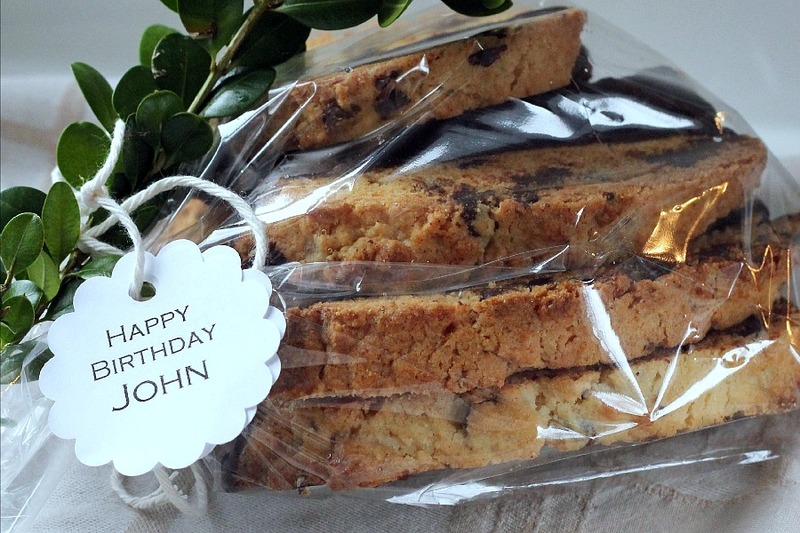 Chocolate Anise Biscotti wrapped in a cellophane bag and tied closed with a string is an appreciated gift for birthday, holidays or just-because. Leave a package on a coworkers desk to encourage and brighten a day. 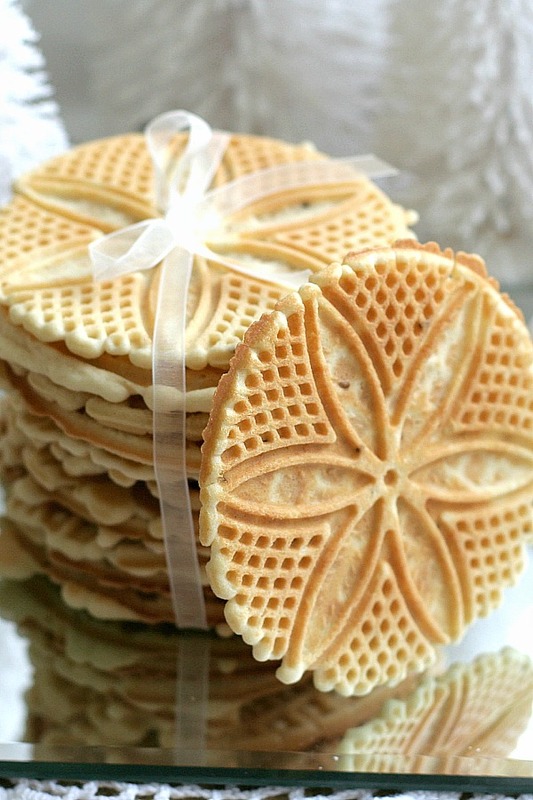 Because the biscotti freeze well, they are great to make ahead for your holiday cookie tray. Just be sure to wrap well in a freezer safe bag or cookie tin to preserve freshness. Preheat the oven to 350 degrees F. Line a heavy large baking sheet with parchment paper or silicone mat. Whisk the flour, baking powder, and salt in a medium bowl to blend. Using an electric mixer, beat the sugar and butter in a large bowl to blend. Beat in the eggs 1 at a time. Add the flour mixture and beat just until blended. Add the ground anise seed and mix well. Stir in the chocolate chips. Form the dough into a 16-inch-long, 3-inch-wide log. Transfer the log to the prepared baking sheet. Bake until light golden, about 30 minutes. Cool 30 minutes. Place the log on the cutting board. Using a serrated knife, cut the log on a diagonal into 1/2- to 3/4-inch-thick slices. Arrange the cookies cut side down on the baking sheet. Bake the cookies until pale golden, about 15 minutes. Transfer the cookies to a rack and cool completely.NOTESTo make the biscotti even more special, dip the bottom edge into melted chocolate and allow to cool/harden on a baking rack in the fridge. To freeze, lay biscotti between layers of waxed paper and store in a plastic freezer container. I loved your blog was a pleasure screen as friend thanks! 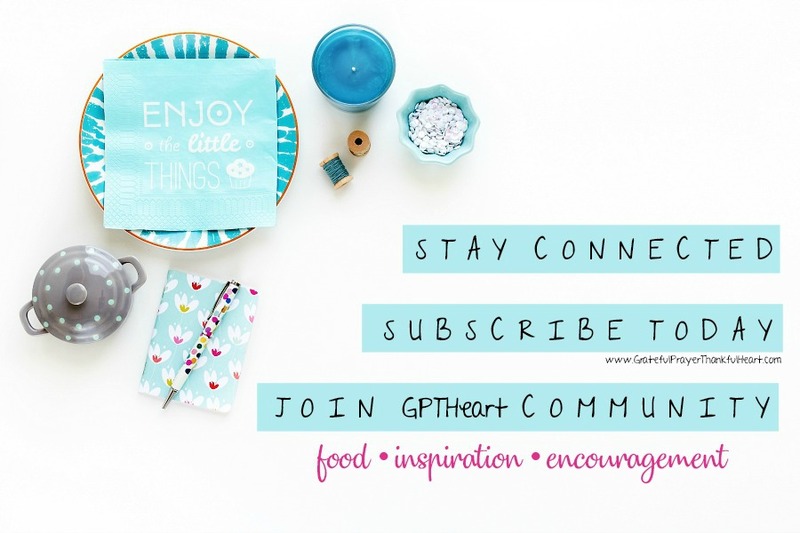 I would love to have you guest post on 5minutesformom.com sometime for our weekly 5 Minutes for Food column which posts on Thursday. I would love to share the details with you. If you can email me at info@5minutesformom.com I can share all the information with you about our column. It is early in the morning, and I am sitting here with my cup of hot coffee. Imagine what it was like for me to see your scrumptious looking biscotti…so tempting. And I do think anyone would be thrilled to receive a gift of those. They look so beautiful and delicious. The recipe doesn't sound too difficult, so I should give them a try. And yes, they would make wonderful homemade gifts. Oh pretty Lorraine…hubby adores biscotti, so I will try yours for hom! Thank you for the recipe and for your wonderful and kind comment on our 38th.! Have a great weekend. Awesome photography dear Lorraine. I love the biscotti too, though this is the first time I'm seeing one. I must confess, I've never made biscotti (even with all the baking I do), but these look delicious. Will have to try them myself, and soon! YUM! These would go so well with my morning cup of coffee. 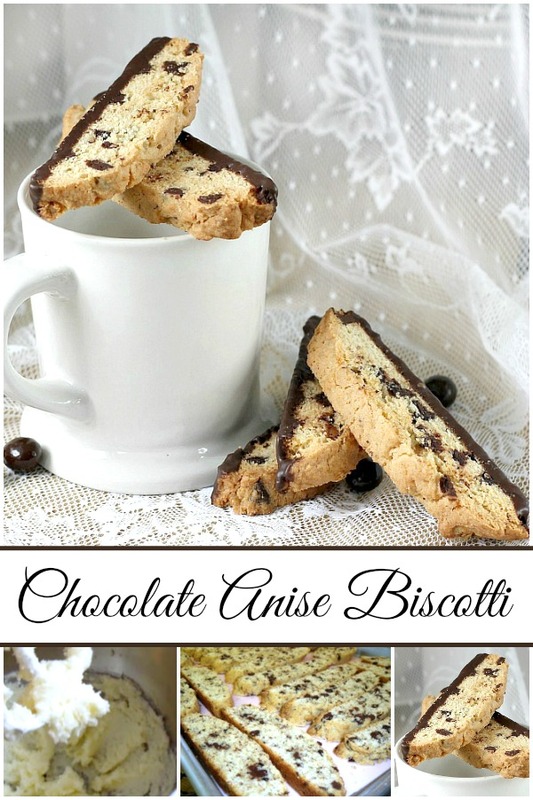 I love biscotti but I've never added chocolate…what a great idea! Last week I baked Lavender biscotti, and now i'm ready for chocolate ones. I have been busy with so much after my mother's Homegoing that I am now trying to catch up on yours. I can hardly believe your sweet granddaughther will be one. Her basket of felt toys is adorable. So much to comment on. You even make oatmeal look good! What beautiful biscotti! They look like a wonderfully indulgent treat. I'm a big oatmeal fan, too. So easy, and healthy. Nice to have a hot breakfast. I put an apple, brown sugar and cinnamon in mine, and milk over top. John still raves about the biscotti you shared with us a couple of years ago. Delicious!